London’s Royal National Theatre has been the distinguished home of some of the world’s best plays, actors, and directors since 1963, when it opened at the Old Vic with Hamlet. Since then, the National Theatre, as it is known, has moved across the Thames to its current location on the South Bank, where it has operated since 1976. For decades, the only way to see National Theatre shows was to go to London, but now, thanks to the “NT Live in HD” program that began in 2009, audiences around the world can enjoy the best seats in the house simply by attending these broadcasts, which are presented in Santa Barbara under the auspices of UCSB’s Arts & Lectures program. The NT Live series of broadcasts continues this month with Nicholas Wright’s new play about the early days of cinema called Travelling Light. Before you react to that now-familiar terrain, understand this — in Travelling Light, the birth of film as a narrative art takes place not in Hollywood, but in a remote Eastern European shtetl at the turn of the 20th century. Wright’s concept was to bring the great Hollywood figures of early cinema back to their roots by imagining what it would have been like if the language of film had been invented back in the old country, rather than in Southern California. 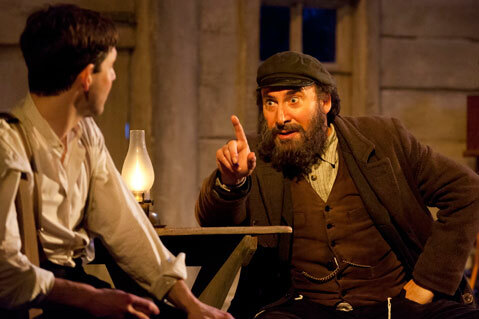 Directed by NT head Nicholas Hytner and featuring a much-lauded performance by Antony Sher, Travelling Light is told as a series of memories from the point of view of Motl Mendl, a successful Hollywood filmmaker looking back on his early days as a young man. The tone is bittersweet, and much is made of the prescience of these Jewish pioneers of American popular art. I spoke with the playwright recently by phone from the National Theatre offices in London, and he told me about what he was trying to achieve with the show. How did this idea occur to you? It began with the concept of imagining Hollywood in a shtetl. I had been reading biographies of some of the early pioneers of cinema, and I was struck by the similarity of their backgrounds, so I sought a theatrical way to make that point. Once that concept was in place, I began to imagine what it might have been like in more detail, and I got quite a lot out of going beyond the basic elements, like the discovery of montage, and including other features of the Hollywood scene, such as focus groups and the casting couch. In fact, it is so true to the realities of Hollywood that the movie never goes into profit. Was there something in your life that inspired you on this project? Well, I grew up in Cape Town and came to England, and what I learned from that is that, while you may feel that you are discovering your true self by leaving what you perceive as a limiting place, ordinarily, you end up carrying a lot of that place with you. I understand that the play involves some film footage, as well. Can you describe how that works? The story involves a young man making a movie, so you see the set and the apparatus, and then the resulting footage, as well. We have a very accurate version of a Lumière cinematograph, and that’s onstage a lot of the time. This play comes after a season of films—like Hugo and The Artist—that also deal with early Hollywood. Had you any idea that you would be part of a trend? No, I did not, although it is interesting that you mention it, because I wrote a play that was produced last year about the Duchess of Windsor, and then Madonna’s movie came out right after, so there does sometimes seem to be something in the air when I write. And could you explain the title, Travelling Light? Of course. It’s the beam from the projector that travels through the air towards the screen, and it’s the main character, who leaves home. Travelling Light screens at the Lobero Theatre (33 E. Canon Perdido St.) on Wednesday, March 7, at 7:30 p.m. For tickets and information, call 893-3535 or visit artsandlectures.sa.ucsb.edu.